1. 11-13 weeks scan : a paradigm shift ! I call you all for a healthy discussion and put your experiences ,which might benefit all of us. It is totally an informal platform without any rituals. It is of immense joy and pleasure to announce that ,I have started Fully automated real time PCR and Automated Karyotyping. This Is possible only because of your help and affection towards me. •	Real time PCR is from Cephid ,France with automated DNA extractor from PSS,Japan. •	Automated Karyotype is Cytovision 7.2 software with Leica DM 2500 advance microscopy from Germany. •	We do hormonal assays on daily basis by fluorescent -immunoassay by VIDAS ,France. These all equipments and software are state of the art in nature and very rare under one roof ,anywhere in India. Along with doing successful Embryology with our test tube baby(IVF) project ,I continued my strive towards advance pathology and molecular genetics and reached to this stage which I dreamt in my younger days. Longing for your further support and co-operation. Ectopic pregnancy – pregnancy that implants outside the uterus – is not viable and comes with a mess of complications like pain, intra-abdominal bleeding, risk of rupture/haemorrhage, possible death and of course emotional wringer. Typically, ectopic pregnancies occur in a fallopian tube (98%) and rarely in a place outside a tube, such as an ovary, cervix or somewhere inside the pelvic cavity. Sadly, ectopic pregnancies cannot be saved. Termination of the pregnancy is the only option when an ectopic has been diagnosed. Health statistics show that approximately 1 % of all pregnancies are ectopic. Although ectopic pregnancies can occur also when a woman conceives naturally, the incidence of ectopic pregnancy for in vitro fertilization (IVF) or IUI cases is estimated to be 1-3%. Fertility specialists believe that ectopic pregnancy in IVF may occur if, when the embryos are transferred to the womb, they are placed too high in the womb cavity or with too much force. The embryos then have a greater chance of “wandering” and implanting themselves in places where they are not supposed to be, such as the fallopian tubes. Other factors that might be responsible are STDs, PID (pelvic inflammatory disorders), endometriosis, previous surgeries in pelvic region, smoking, etc. I would like to share this information with everybody who carries out KARYOTYPING in their diagnostic laboratory. We changed our routine protocol of Lymphocyte Culture after reading the manual of a newly purchased Culture Media (I would not like to mention the name of the company), which assured the increase in the number of metaphases if the colchicine incubation was increased. We followed the same (made it 1hr) and did observe the change. We got better and more fields but….. that was an invitation to another problem. Yes and by the time we realised it was almost close to a month struggling to get crisp chromosome banding. We thought of a lot of possibilities like trypsin not getting activated, change in pH of NS used, change in the buffer concentration, over aging of slides, mishandling, etc. After trying various other protocols for G banding and not getting good results, we traced back the changes we made in our routine protocol. And then again colchicine came into picture. After bringing incubation time back to 15mins we again got banded chromosomes with basic G Banding protocol. So please DO NOT blindly follow the text mentioned in the manuals. It might bring about the change they promise but somewhere CHANGE your results as well!!! Today I did something more than just DNA isolation. I am saying so because the sample that had to be processed was new for me. It was chorionic villi sample sent to me in a tray containing RPMI media. As it goes for DNA extraction from tissues, I had to wash it with normal saline several times but I was perplexed how to clear this foetal tissue from any maternal cell contamination so I increased the number of washes for tissue extraction buffer. Later I was told that the tissue sent was already viewed under the dissecting microscope and so I can carry out the same protocol as done for other tissues. Though the instructions given made my work easy, yet I didn’t like the very first step: tissue disintegration (reminds of making chutney that I would never ever wish to relish). Ewww… The rest of the protocol was only washing with different buffers, centrifugation and so on. Finally I collected 100µl of my target material (DNA) in a 1.5ml vial. Next step was Agarose Gel Electrophoresis. It was nice to see the orange bands (under UV rays) running through the gel, thus finally confirming that DNA was well extracted! In order to analyze chromosomes we follow a set procedure in our Molecular Diagnostics Lab, i.e. Lymphocyte Culture  Slide Preparation  Trypsin Treatment  G-Banding. I have been following the same for quite a long time and this standard protocol gave wonderful results and was able to give reports within 5 days. Problem started when there was a change in the season and mercury dropped! This somehow did change the nature of trypsin and it didn’t get activated properly though I tried all the possible ways to provide the right temperature conditions :-/ So at the end of the day I saw only nonbanded metaphases and to be mentioned they were really clear but still didn’t make really happy. When my mentor, Dr. Mrs. Rinku Banerji, caught this state of mine she asked me to read “The AGT Cytogenetics Laboratory Manual” and this cleared all my doubts. It was well mentioned in the manual – “chromosome morphology is more easily seen on NONBANDED preparations, particularly the terminal ends of chromosomes, which tend to become unclear with trypsin banding.” After reading the entire column I felt that it can be helpful to look at nonbanded metaphases and I did the same. I could check metaphases for numeric and morphologic abnormalities. 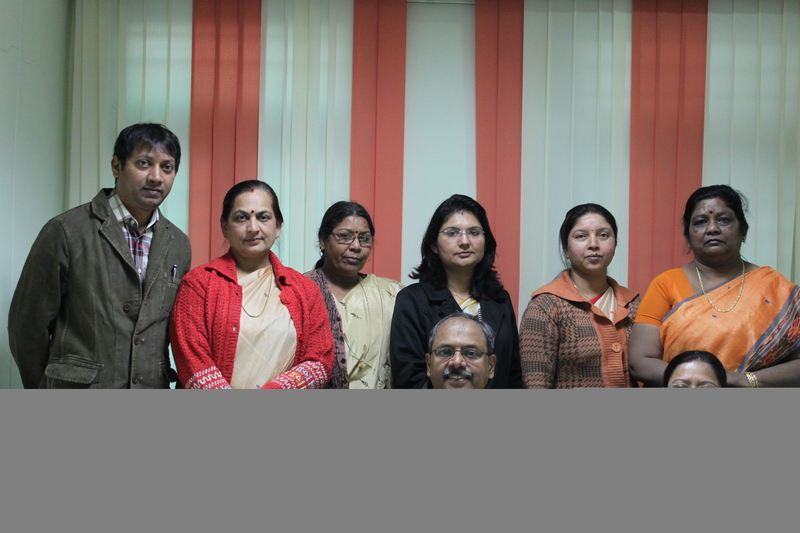 Bridge course on Biotechnology was from 3rd Jan 2013 to 13th jan 2013. 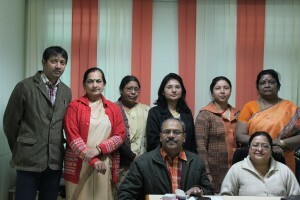 All the participants were well learned . I did a laparoscopy procedure for a doctor ( primary infertility…3yrs). I did hysteroscopy and did bilateral tubal cannulation. Checked the tubes by laproscopy and confirmed that both are open. I will try to put the video of the procedure. I did a trans abdominal embryo reduction. I used the 23 guage spinal needle, and used free hand technique. The reason of doing this reduction is due to the main complication of IVF,that is multiple pregnancy. This patient had failed cycle in first attempt. We did three blastocyst transfer this time ( in earlier cycle two blastocyst were transferred). All the three blastocysts implanted. All have heart activity, but one is growing slow at 10.5 weeks. I chose that embryo to reduce. Previously I was doing embryo reduction ,through vaginal route, but ,after doing eight successful caseses, Patient aborted….so I stopped doing transvaiginal.